Western white pine occurs from coastal and mountainous areas of British Columbia south through the Oregon and Washington Cascades and the Sierra Nevadas in California (5). The distribution of western white pine is limited at low elevations by lack of moisture, and at high elevation by low temperatures. Western white pine occurs from sea level to subalpine areas (3). Western white pine was once abundant in the Puget Sound region before logging activities and the introduction of white pine blister rust. This fungus has reduced white pine populations, but resistant individuals continue to persist. They can be found scattered throughout the Puget lowlands. Western white pine is found from moist valleys to fairly open and dry slopes (3,5). It prefers well drained soils, although the species has been found in bogs (2). Western white pine is a seral to climax species. Due to its large range and diverse growing conditions, Western white pine has many associated species. These include grand fir, subalpine fir, lodgepole pine, ponderosa pine, Jeffrey pines, western larch, western redcedar, western and mountain hemlock, Douglas-fir, and Engelmann and Sitka spruces (5). 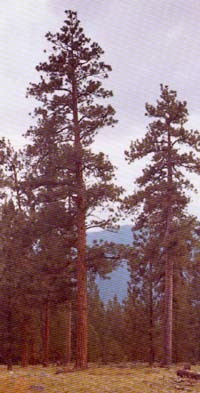 Western white pine is typically propagated by seed. For large-scale forestry applications, it is also propagated via tissue culture or by grafting white pine onto the rootstock of related species. Plants under three meters in height can be salvaged with success as well (2). Pollination occurs early in the first season after cone formation. The egg is fertilized early in the second year and the seed is formed during the growing season of the second year. It matures during this period (late summer and fall of the second year). The cones release their seed immediately upon maturity and should be collected promptly to prevent seed loss (1). Collect seed in June-August from cones that are yellowish to dark brown in color (2). Seed should be collected from blister rust resistant individuals if possible. Fresh seed has been reported to germinate without cold stratification. In most cases, stored seed will require stratification. A two to three month stratification at 45F should provide uniform germination. Soaking the seed for 1 to 2 days in aerated water is also recommended for many pine species (1). As a general rule, pine seeds can be stored for long periods of time (1). Seed life is extended when stored at a seed moisture content of around 10% (1). For a general propagationist, propagation by seed is the most practical method. Tissue culture is also an option if resources are available. No information on soil requirements was found. Installation of seedlings is common. For restoration activities, trees should be spaced from 6-15 feet on center, depending on the desired density (4). No specific information on post-installation care was found. Western white pine is a medium sized, long lived tree. It typically reaches heights of up to 40 m, although much taller individuals can be found (3). (1) Couvillon, G. http://www.uga.edu/plantprop/index.html. Retrieved April 22, 2003. (2) Leigh, M. (1999). Grow Your Own Native Landscape: A guide to identification, propagation, and landscaping with western Washington native plants. Washington State University Cooperative Extension. (3) Pojar, J. & MacKinnon, A (eds.) (1994). Plants of the Pacific Northwest Coast. Vancouver, BC: Lone Pine. (4) Sound Native Plants. http://www.soundnativeplants.com. Retrieved April 22, 2003. (5) Tree Guide. http://www.treeguide.com. Retrieved April 22, 2003.